The grief experienced over the loss of a horse can be deep and profound. Even if you made the decision to euthanize your horse to release him from pain, it does not make your loss any easier to bear. While we all will grieve and heal in different ways, rest assured that grieving over the loss of your horse is completely acceptable—and honorable. After all, your horse was likely a member of the family and you spent many wonderful hours together. So, let yourself feel the pain and grieve the loss. When you are ready, you’ll be able to move on and cherish the gifts that your horse gave you while you were together. Along with the memories you’ll have forever, here are some ways to keep your horse close to your heart. Make photo frames from the last set of shoes. Sand and paint the shoes, then glue a photo to the back of the shoe and weave a ribbon hanger through the nail holes. Plant a variety of flowering bulbs that come up in the spring. Every year, when the flowers poke through the earth with their fresh and vibrant colors, you’ll be reminded of your horse. Hold a ceremony to celebrate your horse’s life. There are no rules here. Do whatever you deem appropriate, and invite those you know were important in your horse’s life—or celebrate all by yourself. It’s up to you. Plant a deciduous tree or flowering shrub in a location where you can watch it during the year. The progression through the seasons can be a metaphor for the shared experiences you had with your horse and the growth you both experienced. If you’ve saved some of your horse’s mane or tail hair, braid a bookmark, a window ornament, a wristband or whatever item would be most meaningful to you. Buy or make a special piece of jewelry—maybe with a horse motif or engraved with your horse’s name—that you wear all the time. Whenever you notice the jewelry, you’ll be reminded of your horse. Create a keepsake memory book of photos, written stories and recollections. Horses change our lives and teach us exactly what we need to learn… if we listen. Jot down the lessons you think your horse taught you. The good, the bad and the not-so-pretty. Do something good to honor your horse. You might volunteer at your local equine rescue organization or therapeutic riding center. Choose a cause that speaks to you, and think of your horse as you participate in whatever activity you choose. Commission a drawing or painting of your horse from photographs you have, or create one yourself. Donate your favorite horse book to your local library, with an inscription dedicated to your horse. Or donate a year’s subscription to your favorite horse magazine or breed journal. Start a new 4-H club or Pony Club chapter to introduce kids to horses, or become a leader of an existing club. Donate time, money or a needed item to your local vet clinic in memory of your horse. If your vet euthanized your horse, send them a card expressing your thanks for their support through this trying time. Vets are people, too, and they find it just as hard to say goodbye to a beloved animal as we do. Finally, as you’re grieving, it may help to read the story titled “Rainbow Bridge,” which you can easily find by searching online. You likely will cry more tears as you read it, but they will be good, healing tears. 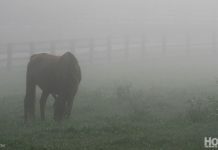 The website www.hoofbeats-in-heaven.com offers support, resources and links to other worthwhile sites for those grieving the loss of a horse. Remember, as you’re grieving, you may feel like you’ll never get over the loss of your horse. It will take time, but eventually the thought of your horse will bring good memories to mind and a smile to your face rather than tears to your eyes. Until that time comes, nurture yourself in healthy ways and spend time honoring your horse in whatever manner best suits you. The author dedicates this article to her childhood equine partner, Surino, a true friend who passed away in 1985. Another thing you can do to honor your horse is to adopt a horse or foster a horse in need. You will feel good helping a horse. You can remember all the good times your horse gave to you and by adopting a horse you will give back to a needy horse and give that horse good things to remember. I really would have liked to see more on what you can do to honor your horse by using their mane or tail hair. This is so sweet I have done at least half of the thing on this list already thanks so much it really helps to know that people really care! I walk around the spots were my horse loved to graze. Coping with Loss is a very good article. I faced a sudden unexpected loss of my 4 year old gray and white paint horse, Traveller, a little over a year ago. I still cannot go a single day without thinking of her. I kept some tail hair and had a bracelet and anklet made with silver beads. The way I cope is by knowing that I will see her again one day, healthy and whole. This article is wonderful! The suggestions are fantastic. Actually, photo frames and bookmarks can be done anytime – just for a fun way to think of your horse. Thanks to whoever wrote this AWESOME article. Its so hard loosing them, I lost my beloved horse 3 years ago and it still hurts. its nice to have someone write about dealing with the loss of our equine friends from someone who has felt our pain and can make light out of it. What a wonderful article, with many great ideas and suggestions for those who have lost their friend. Thank you for this wonderful article. I wish I owned a horse… But I feel like every horse is a part of my family and I have made really good friends with many of them and have lost 3 good friends from the stable I ride at… I will always remember them and their beautiful faces… Thank you for this. It’s great to know we can always have the memories and remember our great equine companions. Whether or not they belonged to us. mane. You can keep it in a bottle or container and put it on a shelf. That way you always have it. Great suggestions! I have a lock of my mare’s mane we put down a month ago. Thank you for the good ideas in this article. Our horse, Flash, will be euthanized in 3 short hours. I just went out to say a goodbye to him before the vet gets here. This is such a sad, sad day for us. We thank God for bringing him into our lives. His was blessed with a long life and had so many human friends. He taught so many kids how to ride and trust a horse. He was such an exceptional, beautiful Arabian. That is a good ideal. I have a lock of hair from my filly, and have it with her pictures. I can not think of a harder time in my life than when I had my horse put down. We just buried my first horse “Cadillac” today. He was a beautiful 17.4 shiny black thoroughbred that gave us nothing but love and we always returned the love to him. My heart hurts right now and I just wanted share this with people. He had coliced right before Christmas and never fully recovered. He just became so weak that he was unable to stand. The vet gave him little chance and recommended us just letting him go. I know we will wonder “what if” but at least he did not suffer. We love and miss you Cadillac! I am very sad because I had to give our horse up “StarFire”. He was a great horse and very loving. I miss him so! I know I could not afford to keep him any longer. But the pain is so very constant. What makes it harder is that my 13 yr old daughter hates me for doing it. She has been crying for a week now. I wish I could comfort her and the pain would go away. We just lost Shawna our beautiful chestnut Morgan. She was a people horse, and my heart hurts, I can barely look out the window at her pasture. She coliced and like Cadillac became so weak and was in so much pain. She had already had two abdominal surgeries and to put her through more pain just didn’t seem fair. The “what ifs” are hard to push away, but I know that soon we will all remember the gift from Shawna bringing our family together. None of us expected one wonderful critter could induce such love and respect. We will all miss her forever, but maybe she is with her previous owner Bill who died unexpectedly and loved Shawna as much as we have been gratefully allowed to for the last 6 years. We found my beautiful 5 yr old bay made dead in the creek two days ago. She had a puncture wound on her belly. Honestly don’t know what really killed her. She was partially under the water, her face buried in the mud. Between the heat and the birds it was awful. We had to drag her out of the creek with the truck. Broke her leg as we did so. I am just devastated. I cry at least hourly. So here I am at wk. N o would understand how heartbroken I am… after all it was just a horse right? She was beautiful, a great ride, had a sense of humor and was my baby… Does anyone else feel how I feel? I feel so alone. Our horse Boy Oh Boy aka teddy passes last night on nov 28 12:45 am. He has a severe case if colic and we just couldn’t keep him alive we tried everything we though he was getting better cause he was standing on his own and then he just quit breathing. It was the hardest thing I have ever had to experience, but I am glad he is out of pain. I just can’t believe he is gone because it happened all soo fast. Rest in peace little guy. December 10, 2012 I lost my horse. I say lost because I still feel tremendous guilt over the word euthanize even though I know we had no other choice. Over the summer, my horse was stung by a bee making his face swell up. Our vet came out and was pushing around the area. This then caused discharge and breathing issues. Our farrier came out and told us to try a new vet. We did. We then found out our 40 year old horse had a rare form of cancer found in young horses. We were told he would live at most six months. We could try chemo but the cancer was aggressive. Within three weeks, my baby lost sight in his eye (he already was blind in one eye). He became easily agitated with falling snow. He started eating less. I would hurry home from work to clean his mane and tail every evening. I loved talking with him and spending time together. I’ve endured several losses the last couple years but I always had my horse to talk to, actually, all I had to do was be next to him and the world stopped. It was him and me, there was no pain, no fear, no hurt, nothing but us. And I know what everyone means when they say nobody understands, because they really don’t. I lost my best friend, my true soul mate. My husband understands because he was close to him too. It’s March now and I still wake at night and cry. I’ve lost my balance…. Does it ever get easier? I’m on day two of my loss, and I grieved before he was even put to sleep. My horse, Stormy, had the kindest soul of any animal I’ve ever know. His eyes were so beautiful and kind. When we went on trail rides, we took care of each other. I read where someone wrote, that everytime a person spent time with her horse, the world stopped, and all the problems just dissolved. That’s exactly how it felt with my boy Stormy. My heart is so heavy right now! Thank you so much for this article, it has helped a lot. My horse was diagnosed with severe colic early this evening. It came as such a shock, put him to bed and he was absolutely fine, his usual cheeky self. Went to check on him and he was rolling around in pain, 2 hours later he was euthanised. One of the hardest decisions I’ve ever had to make. What was most difficult is how painfully quick I had to decided whether to take him to surgery or let him go. I chose for him to be euthanised because I know that was the best thing for him. I will never ever forget him and I love him so much. I had to make my decision to sadly say goodbye to my best friend in the world, Savannah 25 years of partnership, fun and laughter together. I could talk to him and he would, sort of understand but never judge me, always greet me. I have lost a big part of my world when I said goodbye. I will never forget him. and I will see him again. my heart gos out to all who have lost a dear friend like this it hurts. I write a blog, so I wrote a lengthy piece about my horse Hadarah and her life and posted it online, complete with several photos of her and me riding her. I also saved mane and tail hair for making articles, such as bookmarks or bracelets, and I have my favorite framed photo of the two of us on the wall above my desk in my office. I’m sobbing as I write this. My daughter and I lost our homebred gelding on Tuesday morning to Botulism. It all went very quick. he was dead within 36 hours. The clinic called my daughter on Tuesday morning to say he was dying unfortunately she arrived minutes after he died and she is inconsolable that she never got to say goodbye to him and he died on his own. I’m suffering twice over watching her suffering and so wan to take her pain away yet I can’t even deal with my own pain. My daughter lost not only her soul mate but all her dreams and hopes. To make it worse, we lost his mother 2 years ago but her passing was made easier because we had him. Now we have nothing left of her and we are grieving all over again for her as well. We need to be able to talk to someone who understands but where do we find them. I just lost my beloved Dreamy this past Sunday. It was all so sudden. One minute he was ailing but it would be a long recovery, the next there was nothing we could do. I still cry every night. We had to euthanize him. Lost my poor boy to Laminitis. He was foundering with a 13° rotation. Rest in peace, little one. I adopted my horse Ole Dan back in July and had him for over 20 years. The gal that took him traded him for a pony and now she does not know where my horse is. I would fell so much better if I know where he is. I feel guilty because I gave him up and now don’t know where he is and would LOVE to see him and give him another hug! It makes me cry to write this. My beautiful 33 year old blackjack just died 3 days ago and I’m in depression. He was a beautiful morgan. I feel part of me died with him. I have decided to cope with my depression by rescuing another senior horse where I got him. In memory of blackjack I will adopt another who will need talc. To save a life is to honor his life. My Derek had a heart attack and died this morning. I can’t stop crying. Every time I close my eyes my mind goes to our happiest memories. How will I ever move on? Jennifer, I understand. The only horse I’ve ever loved died a few days ago and I am heartbroken. I miss him so much and cry constantly. I found this page because I’m desperately looking for help in dealing with the loss of my beloved mare. She was my first horse, passed away suddenly and very unexpectedly on October 17, 2016. I just cannot get myself to function; this is the worst pain I have ever experienced. My heart hurts for you all who have lost your precious horses! Reading these comments makes me realize I am not alone in how much I love my horse. I definitely needed this article. On Wednesday. April 12th, 2017, my horses got out and two of them got hit by cars and died almost instantly. One of them being my first horse and he took his last breath as I was crying holding his face. My other horse, Mandy took the hard hit and died instantly. I am dealing with a dark part of my life as I try to get over my most prized possessions. I will miss you Yogi and Mandy, RIP. We lost our beautiful girl Missy yesterday to colic, we are absolutely devastated and heartbroken, we have lost a big part of our family.